Discover the Many Treasures of Natashquan! PrintBackDiscover the Many Treasures of Natashquan! Natashquan, which means “where one hunts for bear” in the Innu language, still feels a little bit like the edge of the world, no doubt because this village of nearly 300 people in Côte-Nord was, until very recently, the end of Route 138. Since late September of this year, it is now possible to drive to Kegaska, 44 km (27 mi.) further east. When you first arrive in Natashquan, be sure to visit the Copacte tourism office for information about what’s going on in the village during your stay. One of the walls of the office is covered in photos of local villagers taken by Anna Birgit, a Danish woman living in Paris who has recharged her batteries in this corner of paradise every summer for over 40 years. Famous local poet and singer/songwriter Gilles Vigneault, whose childhood home is still in the village, also comes back every summer and takes advantage of his visit to offer writing workshops. It’s easy to see what draws them back here year after year: this small community located on Innu territory will delight you with its rich history, old-fashioned charm and many treasures. From the Copacte tourism office, you can see one of the area’s most famous attractions: Les Galets, which was designated a heritage site in 2006. Only 12 of the original 33 fishermen’s cabins that made up the village are still standing in what was once the busiest fishing centre in Côte-Nord. At that time, fish was dried and salted in these buildings. This area has several other attractions. For example, the church, one of the oldest in Côte-Nord, was built in 1861 and was originally a chapel. It’s worth seeing mainly for its roof, in the shape of an upside-down boat hull, which was built from two shipwrecked vessels and entirely sculpted by hand. 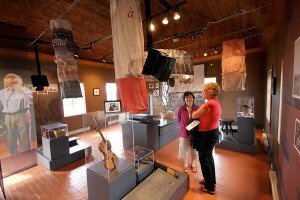 Nearby, the old school (Vieille École), which was restored in 2000, has become a small museum that pays tribute to the inhabitants of the village, including poet and singer/songwriter Gilles Vigneault, by far the most famous. Natashquan is a land of traditions—it’s one of the few places in Québec where Mid-Lent celebrations still take place. It is also recognized for its crafts, especially those of the Innu people, and every summer since 2006 the village has hosted the Innucadie Stories and Legends Festival. If you like music, you’ll want to visit Café L’Échouerie where there’s always something going on. This friendly and colourful venue is run by Doris Minier, who was originally from the Saguenay region but fell in love with Natashquan. Inside, the many books almost make you feel like you’re in a library, and the café often hosts concerts, plays and painting exhibits. You can also grab a bite to eat, of course: the food is simple and traditional fare. 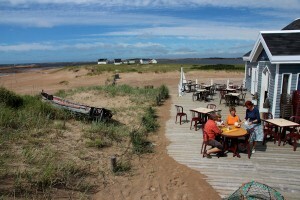 Perched on the sand, the café offers a stunning view of Natashquan Bay, which is appreciated for its shallow temperate waters at the mouths of two rivers. How can you resist?